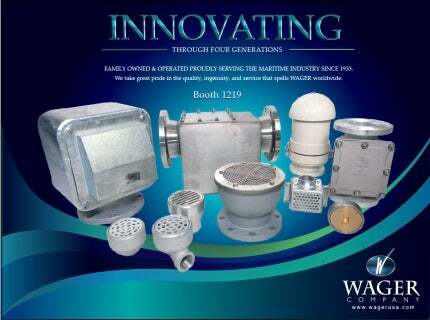 Wager is a specialist manufacturer of high-quality valves and deck equipment for the maritime industry. The inverted vent check valve was invented by the company founder and president Robert H Wager. Throughout the decades, Wager continues to offer a full range of quality vent check valves and rugged deck equipment. The company’s inverted and vertical vent check valves are all ABS-approved. In an effort to comply with the most up-to-date regulations set by ABS, it has an extensive on-site test facility. Each valve, along with its component parts, is rigorously tested in order to assure both quality and functionality. In addition to current ABS requirements, Wager now performs discharge reverse-flow tests for engineering. Wager’s new ABS-approved mud valve is a new addition to its range of vertical vent check valves. The company’s unique design forces the liquid mud through a spring-loaded door instead of an expensive burst disc that requires replacement after each use. Wager’s 1660 tank air escape valves with cover allow free passage of air into tanks, dry cargo holds or storage space. They protect tanks and bulkheads from pressure build-up during loading and unloading of liquid or dry cargo, as well as assure maximum efficiency during operations. Tank air escape valves do not have a float or automatic closing feature, so they are suitable for locations that are not accessible to seawater. All steel castings are hot-dipped galvanised and aluminium castings are anodised. Wager’s 1700 Series inverted vent check valves are also available, which are equipped with floats. Robert Wager proudly celebrates 81 years in manufacturing valves for the offshore and maritime industries. All valves meet or exceed standards required by ABS and the US Coast Guard. The company’s wastewater division offers clients a range of odour control vent valves, which aim to protect the environment from H2S gas from gravity lines, lift stations, wastewater treatment plants and wet wells. Wager is also a worldwide industry leader in the design and manufacture of opacity meters for monitoring diesel emissions. The company’s portable and inline systems are easy-to-use, rugged and accurate, including the new handheld wireless opacity meter and printer.